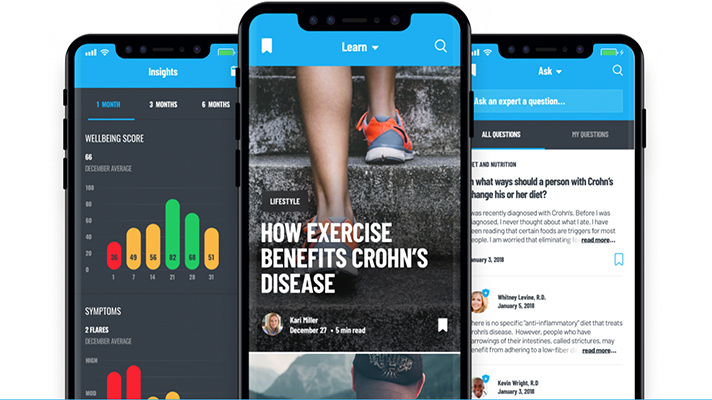 Oshi Health, a digital startup focused on digestive health, has launched a mobile app specifically designed to help inflammatory bowel disease patients understand and manage their condition. Weinstein described the app as an all-in-one mobile platform with three primary aims: condition and lifestyle tracking, patient education, and active IBD management. To better understand the reasons for their disease flare-ups, patients can record their symptoms, quality of life measurements, and other factors known to impact conditions such as diet, sleep, or exercise. Along with this, users can also learn more about their condition with educational articles, recipies, and materials featured in the app. Roughly 40 of these rescources are already available in the app, Weinstein said, although Oshi has more articles slated and is targeting a near-daily release schedule. With these tools and others — such as reminders, surveys, and expert Q&A — the overall goal of the app is to help patients take action and work toward improving their condition, Weinstein said. These digital efforts will serve as the foundation for Oshi’s longer-term aim, which involves leveraging a community of IBD patients as a potential source of data for disease research, personalized insights, and, potentially, a new digital therapeutic, he continued. “As we’re able to collect and correlate these different bits of information, there are insights that we can generate that will be unique, and then we can start understanding why patients have flares. We can start predicting those flares before they happen so that they can start different treatments, and eventually we can [potentially] prevent these flares,” he said. Oshi is a young company, having been founded earlier this year through Boston Consulting Group Digital Ventures. Weinstein, previously the cofounder of mobile respiratory care company Cohero Health, was brought on to head the startup that he said has already found its footing.